Credit where credit's due: well done Ocado! Last week our grocery home shopping competitor Ocado won the BT Retail Week Technology Award for their iPhone and Android Ocado on the Go apps. The two applications are excellent examples of applying technology appropriately for the customer's benefit - making the process of grocery shopping easier and more convenient. I'm sure our forthcoming grocery apps will be worthy competition. Indeed if we can even do half as well as Ocado's claim that 5% of orders are made through their apps, then we we will be more than happy. So take a bow, dear competitor, and let's see how well we do alongside you when we launch our grocery apps in another month or so. After all, with both of us raising our game in the world of mobile we both know who will benefit the most: Our customers! I've talked about our forthcoming launch months for our grocery apps fairly openly. Isn't there a danger that our other online competitors, Asda and Sainsburys, might launch their own grocery apps ahead of us? My honest answer is: Let them! We want our offerings to be a real step change in the customer experience and, to answer the question, "Do you want it 'right' or 'now'?" we just want it to be perfectly right. I think our designers have done us proud with their thinking, and we just want to be sure with our test users. We lost the 'First' trophy to Ocado. So we're going relentlessly after 'Best'. 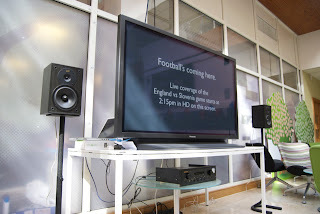 HD England World Cup Football at Tesco.com HQ - R&D style! 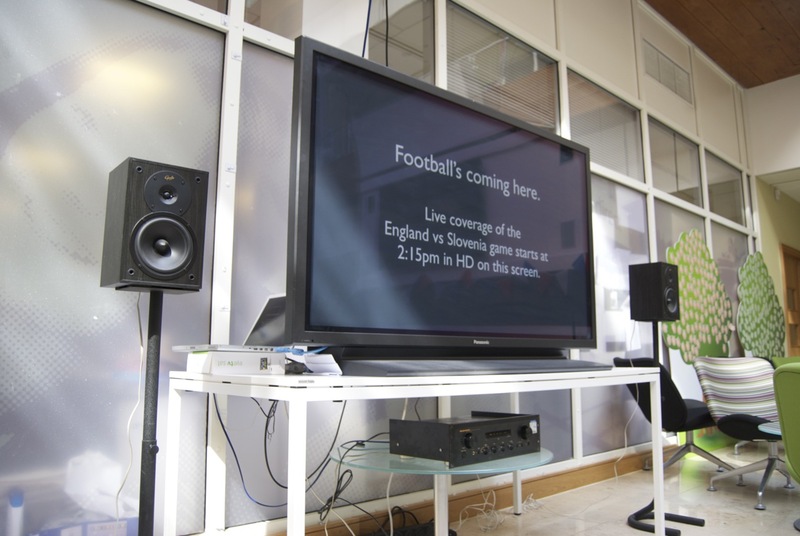 Today R&D is hosting the crucial England vs Slovenia World Cup game in the atrium on a 65" (165cm diagonal) HDTV. This TV is fed by an Apple Mac connected via DVI cable and using the Mac's excellent graphics card to decompress and render a full HD 1080i high definition signal from the BBC HD channel received from satellite by an Elgato EyeTV Sat receiver. Oh yes! Tesco.com is a great place to work! Listen, dear reader, I haven't asked you for money in the last 18 months so when I do, you know I'm being deadly serious. It's a rare event and I intend to keep it that way. I'm running the 2010 British 10K London Run on 11 July 2010, and I'm trying to raise £500 (that's US$750 or EU€600) for a charity that is very close to my heart - the Albert Kennedy Trust. They are a small charity that provides supported lodgings, mentoring, information and advice for gay, lesbian and bisexual young people who are homeless, living in a hostile environment or in crisis. Whilst it is crushingly sad that such hostility exists towards gay youngsters from their own families, I find it better to acknowledge the reality of this situation and help them all I can through Albert Kennedy Trust's work. Please spare £5 or equivalent from your debit or credit card (most worldwide cards accepted) and click here to go to my Justgiving page. If you're reading this article on my blog web page, there is a widget on the right you can click. I'm practicing hard for the run, nothing half-hearted, so please donate right now and then it's done, with my total thank you for your generosity! If you want to know more please watch the embedded YouTube video below. As you know, at Tesco.com we targeted iPhone first. Yet if I was to draw a Venn diagram containing two circles - one representing the population of Tesco online shoppers and the other the population of people with iPhones - you would see that the overlap between the two circles is only very small. However, if we created a third circle representing a phone that has a large overlap, we would find that it would be largely incapable of running anything. Our core online grocery shoppers are busy Mums with a hectic lifestyle thanks to their kids, and they tend to have mid-range handsets. Their phones are cheap or free and are used to make phone calls or send text messages. We can’t reach them with a decent internet web service or app until they enter the upgrade curve naturally to a smart phone over the next 18 to 24 months. They feel no hurry: very few of our busy Mums are frustrated this morning because they can’t pre-order an iPhone 4 now Apple’s order books are full. Early yesterday evening I sat in the corner of The Only Running Footman, an olde London pub in Mayfair. I was there to kill an hour between the end of a conference in nearby Piccadilly and before a business dinner engagement, and I thought I would use the time to catch up on email and news. So I whipped out the iPad, asked a member of staff for the wifi password and got started. I soon noticed admiring glances (and not at me!) - within 15 minutes no less than five people had come over and asked if they could have a look at it. The good news for me was that the Footman is the sort of place that attracts clientele who would want their own iPad rather than want mine, so I was happy enough to show them. All five admirers were wowed by the iPad and told me they now plan to buy one. The iPad is, therefore, an example of a what I call a “Hero” device. It attracts a crowd, it is considered ‘best of breed’, and (importantly) the journalists who might discover and write about your app have one. I first mentioned the concept of “Hero” devices at MobileMonday this week, and I note that several attendees to that session have quoted me talking about the benefits of targeting these devices first, and admitted to poor uptake when they targetted the actual phones used by the main demographic of their customer base. So back to our first app being made for the iPhone. As I have said in a previous post, we chose it because I have an iPhone and so it was a good starting point. Talk about the right choice: even when I blogged that our first app was rejected by Apple, that made headline news. When we finally managed to get Tesco Finder into the App Store, again a round of journalistic column inches resulted. In addition, the whole company has felt good about having a presence in Apple’s App Store; it has given Tesco a sense of being innovative and forward thinking. If I had targetted a non-hero phone first and blogged about our app in that phone-maker's app store then I dearsay journalists would have yawned and a few of you would have removed me from your blog reader having been instantly bored. “Hero” devices enjoy more kudos, craving, and column inches than any other device. This gives you access to a halo effect of marketing and general brand feel-good that you just don’t get when you target any other device. You may find that your core customer base doesn’t have a “Hero” device. Don’t let that stop you having a presence on it. Yesterday evening I joined a panel of 'thinkers' at a session of Mobile Monday London, hosted at Microsoft's Victoria offices in London. Chaired by Marek Pawlowski of MEX (the strategy forum for user experience), the session was entitled "Living in a Multi-platform World" and explored the challenges of developing for the much more fragmented world of mobile operating systems and hardware. I was joined by fellow panellists Oded Ran from Microsoft's Windows Mobile 7 team, Tom Hume who is MD of Future Platforms, Jerry Ennis who is the CEO at the social networking site Flirtomatic, and Ilio Uvarov, leader of user experience practice at RG/A London. The sixty-strong audience of Mobile Monday were mostly 3rd-party mobile developers, or small companies running on venture seed capital aiming to implement their good ideas in the mobile market. Excellent and detailed notes from the session are available at this entry in Adam Cohen-Roses's "Expanding Horizons" blog. What intrigued me was the challenge that many developers were experiencing as they had to build their skills for such a fragmented mobile landscape. For example, if you develop a successful iPhone app and wish to port it to, say, Android, you have to learn a whole new programming language and work with a different development environment. Consider Blackberry and you have a third language and development toolset. Microsoft and Nokia, fourth, fifth and so on. Several member of the audience were looking for 'something' that would make the transition easier; that allowed them to stop feeling that they were starting from scratch each time they made the decision to target a different handset. I had unwelcome news for them. 3) Use design to create an engaging, even immersive experience. So the bad news I gave the assembled audience is that, if they try and short cut the process of creating a reliable, engaging app that fulfils the customer's need on their phone, then they end up with a mediocre offering and little success. I've seen 'mediocre' over they years so many times with Java applications - remember their 'write once use everywhere' philosophy? The result was uninspiring and unremarkable applications that could use only the lowest-common-denominator facilities across the 'everywhere' world. Java has found its greatest strength when the applications built using it are hidden as server services or utility applets. Glamorous they ain't. The mobile phone world is the exact opposite: It demands a great experience for each make and model of handset. That's despite the variation of capabilities, CPU power, screen resolution, colours, aspect ratio, touch/non-touch ability, buttons and more. If there is one element you may be able to port, its your set of excellent user-interface designs - and even then you will have to have variants to fit the various screen sizes and shapes, and whether the 'phone uses buttons or touch. The unfortunate lesson is that, unless you can target a group of handsets - and deliver the best experience tailored experience for each one of these handsets - then don't bother at all. Let's make that positive: If you make the time to deliver a best-of-breed experience for every particular handset you target, your application will be savoured by its users because you have made them feel special through a great experience. You may even have validated their choice of handset because your app works so well and looks so good on it. Competitor apps may do more but yours can also be successful if it does less, better (comma important). Believe me, customers who experience fantastic design and a great implementation on their mobile will reward you with commitment and loyalty. That's a prize worth the pain of starting from scratch each time. Just 7% of customers to go and we'll have 100% of them on our new 'project martini' Tesco grocery web service - and available to you through the Tesco Grocery API. The API (and its documentation) has been substantially updated this lunchtime. You'll find the updated documentation in the Reference section of the TechForTesco forum. Secondly, the API now supports "Amend Order Mode", a comprehensive new addition that enables a customer to add or amend an existing order that is already checked out and is pending delivery. It’s power lies in the fact that, once the order is initially checked out, the customer can add products to it using your application without any further visits to the Tesco web site to checkout again before delivery. You can amend such an order right up to the eve of the order being delivered. Happy retirement Sir Terry - and thanks for choosing the IT guy! Sir Terry Leahy announced his forthcoming retirement today; from next March his role will be taken by Philip Clarke, who is currently Tesco's international and IT director. That's right: in an all-too-rare event, the IT man has made it to the top - it will be great knowing that Tesco will be run by someone who totally understands the computer systems that keeps our company agile and soaring at top-flight. All of us are sad to see Sir Terry go, of course. Company-wide, staff have such respect for the man who enabled Tesco to provide a greater supermarket experience, head into overseas territories, onto the internet, into catalogues, sell a far wider product range than food, and provide services from a mobile phone network to banking. Indeed, through the journey Sir Terry has taken us on, I have long stopped thinking of Tesco as a 'supermarket'. We have become far greater: an 'international retail brand'. Now he's handing over to the IT guy. Fantastic! I've just bought an iPad. It's the 16gb Wifi only version and I'm sat in the garden typing this entry on it. Today we met with the designers who are building our grocery mobile apps so we could review progress and think about what we wanted to do over the coming year. They brought two iPads with them. 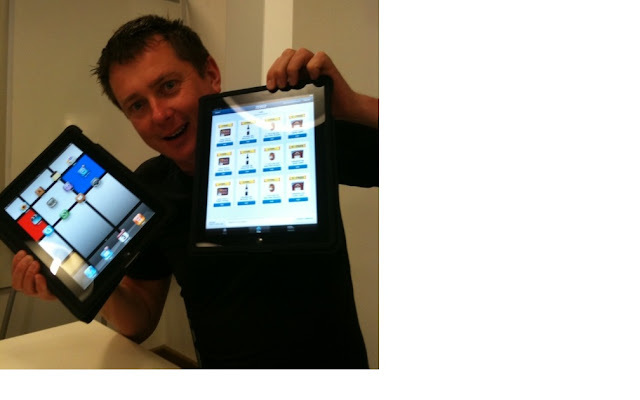 On one iPad they had a mock-up of Tesco grocery shopping on it. On the other they had their presentation. The wine aisle could consist of wooden shelves with occasional bottle-boxes and the sense of a cellar back wall. The bread aisle could have the bread products on flour-dusty shelves with the sense of sails passing a window in the background as the brain perceives the inside of an olde windmill. I'm even hearing Windy Miller's Windmill sound effect... (link goes to "Oatso Simple" ad with Windy Miller and the sound of hiswindmill in the background). See what I mean? That's what an iPad does to the imagination. If I can be turned from mildly sceptical to moderately enthusiastic in the time period of a single meeting, imagine what we could do with the Leadership team's enthusiasm levels. So now I think I better spend R&D budget on an iPad after all. It a was good meeting. Tesco.com HQ has been disrupted by colleagues with iPads who seem to create groups of people who gather around them whenever they carry the things about the office. Which they're doing. Blatantly. Sarah (middle) and Becky (right) caught admiring Lucia's iPad. Oh and they get them out and nonchalantly go to the Tesco.com website which they zoom about impressively with various hand gestures, or run a drawing application and sweep about the screen creating instant art with some fluffy-ended pen thing. The iPad doesn't come with an webcam, so sweet thoughts of using one in a kitchen where the customer points a barcode or just the product itself at it to try visual searching for easy grocery ordering is not available. So I'm not buying one, not even on R&D budget! I'm just back from one of my splendid 'cycling and cider' holidays in Cornwall - mountain biking through the fantastic trails set up around Calstock and Gunnislake in the day, delicious local cider procured from any one of a number of local cider farms in the evening (and it's important to get it that way round). While I was away, Apple finished quality-assuring the latest version of Tesco Finder, which now supports barcode scanning through the iPhone's camera. Management and editing of product lists has been improved, too, such as being able to delete a shopping list even if there are still products in it. It just so happened that the day following the launch of the update, our R&D server (that supports requests from Tesco Finder applications) rebooted inconsistently from a Windows Update event. At the time the hubby and I were out biking in the middle of a trail through the woodland across the Tamar river from Gunnislake where mobile signals don't go. It was only when we climbed up next to the ruined chimney of an abandoned tin mine above the forest that my phone started alerting me that something was wrong. Fortunately on that day the phone I had taken was my Google Nexus One which I have grown to love over the last few weeks despite its occasional glitchiness. It just so happens that some time ago I had downloaded a free app called "Remote RDP Lite" which acts as a simple Windows remote desktop client. Despite the GPRS-only data signal, I was able to reach the server / login / check a couple of logs / reboot it whilst I sat on the hillside. After 5 minutes I used the Nexus One's web browser to check the admin web page for Tesco Finder and discovered that once again requests were coming in thick and fast - and being processed successfully. You might wonder why it was that a colleague didn't reboot the server? Yes I have wondered that too since an important group of them know where all the account and server login information is kept. It's in a safe to which they have the combination, and inside is an envelope containing login information, on which I have written "Everything that has a Beginning... has an End". This dark motto reminds me to ensure that we always have the ability to access the knowledge of any R&D project, in case one of us should be accidently terminated (for example, a losing a dimension having been hit by London bus, or mountain biking unexpectedly over a cliff). Apologies to customers whose sparkling new Tesco Finder didn't work for a few hours, and also to developers trying in vain to get the API to respond. I've stopped the server from automatically installing Windows updates and immediately rebooting - we'll be doing that manually for a while.